The new Helping Families Save Their Homes Act became effective immediately and will expire in 2012. It includes provisions such as a 90-day pre-eviction notice. Renters also have the right to remain in their homes according to lease terms unless the property is sold to an owner who will occupy the residence. The City Council has proposed an amendment to the Vacant Property Ordinance which will clarify the definition of "owner" of any property subject to the ordinance. The amendment also seeks to include in the owner definition any parties that initiate foreclosure proceedings such as financial institutions and any entity in charge of or have control of the property. This can include property managers, executors, or trustees. The proposed ordinance text can be found here. The next meeting of the Committee on Housing and Real Estate will be on May 28th at 10:00 am in Room 201-A at City Hall. An proposed ordinance is also moving through Council to make City Asset Lease Agreements that are worth more than $10 million publicly available for review both in written form and electronically. City Asset leases include the Chicago Skyway, the proceeds of which help fund the Chicago Low-Income Housing Trust Fund, The Downtown Public Parking System and the more recent lease of the city's Parking Meter System. With the large amount of revenue and its share of controversy generated from the privatization of the city's services and infrastructure, making the lease agreements publicly accessible ensures that these funds are being used to its intended purposes. The ordinance text can be found here. The next Committee on Finance hearing will be on June 1st at 9:00 am in Council Chambers at City Hall. With the General Assembly nearing the end of its Regular Session, now is a time of a lot of movement for bills in both houses. Friday, May 22nd, is the deadline for the third reading of substantial bills, one of the final steps before a bill becomes law. If a bill is approved by the second house it is then return to its house of origin for amendment concurrence. Both the Senate and the House are scheduled to adjourn on May 31st. Multiple bills related to housing have already made it through both houses and are returning to their house of origin to confirm any amendments that have been added. House Bill 3863 is one such bill that would require additional notice for occupants in the case of foreclosure. Additionally, House Bill 3863 provides for a 30 day period after a judicial sale for a tenant to remain in the unit. Text of House Bill 3863 is available here. House Bill 2653 works to avoid foreclosures by amending portions of the Homelessness Prevention Act to expand forms of assistance. Currently grants are only available to pay rent in order to avoid eviction but passage of the bill would expand grants to include mortgage payments in arrears for up to three months. Full text of House Bill 2653 is available here. House Bill 688 creates guidelines for identifying and dealing with distressed condo properties. Criteria for distressed buildings include the tax delinquencies, foreclosed units and utility shut off. Once a building has been declared distressed by the courts, municipalities will be able to take steps to bring the building back in line by placing the building with a receiver who is empowered to take over the functioning of the building. Full text of House Bill 688 can be found here. As this legislative session comes to its conclusion, both houses are also working to develop an operating budget as well as continuing the effort to finalize a capital plan, both would surely impact the work of all community development corporations and their partners. HUD has issued guidance on the Green Retrofit Program for Multifamily Housing. Deadline to apply is June 15, 2009. Details and more information can be found on Recovery.gov. The City of Chicago has issued a Request for Proposal for Community Services Block Grant (CSBG) funds made available under the American Recovery and Reinvestment Act. Download the RFP here. The Department of Treasury and HUD announced a partnership that will help fill the financing gaps in affordable housing developments participating in the Low Income Housing Tax Credit program. Because of the ailing housing market, the LIHTC program has been adversely affected with many affordable housing developments unable to fill development gaps because of lower tax credit pricing. The Treasury will provide state housing credit agencies with grants in exchange for LIHTC at a flat rate per dollar credit. Additionally, the Treasury will provide an additional $2.25 billion in grants to housing finance agencies for qualified projects under The Tax Credit Assistance Program. For more information, see HUD's announcement. From March 31 to April 4 of this year, Bickerdike Redevelopment Corporation opened its Section 8 waiting list seeking to gain qualified applicants. As a result of practical considerations and immense community need, the application process was opened for five days, in marked contrast to the two-day event in June 2007, the last time Bickerdike opened its Section 8 waitlist. The need for affordable housing was clear: lines were formed well before doors were opened, with many standing in line for hours and waiting in shifts. Bickerdike distributed over 5,000 applications during the five days, of which over 4,000 were returned. Carmen Conde, a project manager at Bickerdike, is the first to admit that the received response was "even bigger than we had anticipated" and is a strong indicator of the growing and continued need for affordable housing in West Town, Humboldt Park, Logan Square and Hermosa. The application was specifically for four properties: West Town Housing Phase I, West Town Housing Phase II, Victory Apartments and Humboldt Building, for a total of 454 units, of which only a fraction become available annually. For qualified applicants, there will be a lottery for these properties. Those who are not allotted a unit in this round will be placed on a waitlist for all of Bickerdike's Section 8 properties. Once families are on the list, the wait time for Bickerdike's Section 8 units can be 3 to 5 years. CRN staff was present during one of the lottery days to assist in processing the large number of applications. When we arrived, we found a large and diverse array of folks who had already been entrenched in the process for two days- several tenants from other Bickerdike properties, executive director Joy Aruguete and large part of Bickerdike's staff. Laughter and sincerity filled the room as busy hands worked on processing the more than 4,000 applications from area individuals and families. Chicago Rehab Network's new audio and multi-media project Talking to Walls covered this event in more depth. Check back at www.chicagorehab.org for an upcoming feature on Bickerdike Redevelopment Corporation. 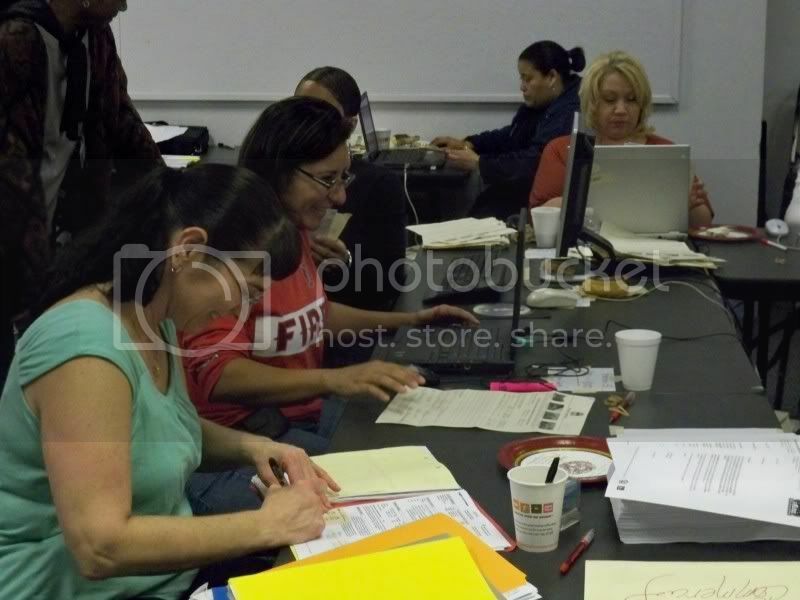 Photo: Bickerdike Redevelopment Corporation Executive Director and CRN Board Member Joy Aruguete (left), Bickerdike staff, and tenant volunteers sort through thousands of applications for Section 8 housing. Chicago Rehab Network members and invited guests will soon gather for an important meeting to hear issues impacting the community development community field today. Key leaders in government, agencies, and organizations with important roles in new programs enacted under the Housing and Economic Recovery Act and the American Recovery and Reinvestment Act will be present to provide information and answer questions from the community development field at-large. HUD Community Planning Director, Ray Willis is invited to speak on the recently announced second round of the Neighborhood Stabilization Program, a competitive funding opportunity open to non-profits. Chris Raguso, the Acting Commissioner of the new Department of Community Development will present on her leadership role in the department as it takes the lead in addressing the city affordable housing needs during a time of economic instability. Also presenting will be Catherine Godschalk from Self-Help Ventures Fund, an innovative organization with expertise in Lease-To-Own use models, a critical component in addressing the foreclosure crisis. Additionally, Robert Wharton of the Community and Economic Development Association of Cook County and Anne Evens from Center for Neighborhood Technology will address new weatherization resources coming to Illinois and John McDermott from Logan Square Neighborhood Association will provide an update on their efforts in preserving affordability at Lathrop Homes. With a packed agenda, CRN members will certainly have plenty to learn and take from the meeting. Members can RSVP by contacting CRN. CRN's membership is comprised of over 40 nonprofit community development organizations and housing advocates. Visit www.chicagorehab.org to learn about CRN. The Illinois Housing Development Authority (IHDA), Illinois Department of Healthcare and Family Services, Illinois Department of Human Services, and Illinois Department on Aging invite property managers, owners, and landlords to list your properties for FREE on ILHousingSearch.org, a new housing resource for the state of Illinois. This service can be used to advertise rental properties completely free of charge. Listings can include pictures and detailed information about each unit, from location, rent, and bed/bath amount to appliances and utilities, neighborhood amenities, and much more. A toll-free call center is also available for support. Go to ILHousingSearch.org or call 1.877.428.8844 for toll-free assistance. Community development corporations are invited to participate in the first sustained investigation into the struggles, successes, and prospects of Chicago Metro CDCs. Watch for an email invitation next week with details on how to participate. Contact CRN at 312-663-3936 for more information or visit our CDC Census page for future updates on this exciting new project. We have added a News Links feature to our website! Keep informed of housing events and news by subscribing to our news feed. Only a few workshops left in this year's Community Development and Empowerment Series! 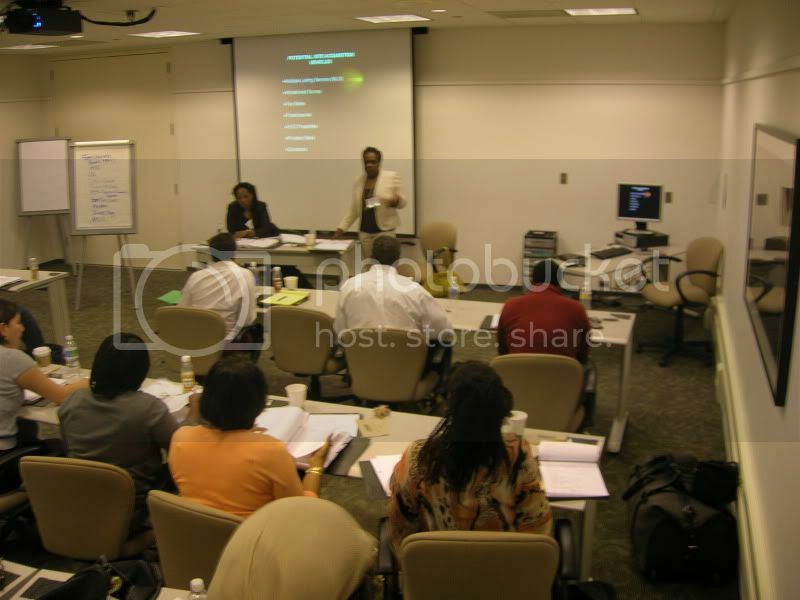 Visit our Capacity Building page for more information on upcoming workshops and registration. The 2009 Community Organizing Awards will be held on Wednesday, May 27, 2009, 5:30 pm-7:30 pm at the Chicago Regional Council of Carpenters, 12 E. Erie, Chicago, IL. The event is hosted by The Chicago Community Trust, Wieboldt Foundation and the Woods Fund of Chicago. RSVP to awards@wieboldt.org. The 15th Annual Deborah's Place Gala Celebration will be on Friday, May 29th at the International Ballroom at the Fairmont Hotel Chicago. More information and for how to purchase tickets available here . Access Living will hold its 2009 Gala at Navy Pier Chicago on June 2nd. This year's gala will honor Sen. Ted Kennedy and Dr. Henry Betts. Visit Access Living's website for more information. The 16th Annual Celebration of Home and Garden to benefit Heartland Alliance on Human Needs & Human Rights will be held on June 6th. A self-guided tour of homes and gardens in Southwest Michigan begins at 11:00 (EST). Visit www.homeandgardentour.com to register. North River Commission's Community Congress will be held on Wednesday, June 7, 2006 from 4:00 pm - 6:30 pm at North Park University Hamming Hall (Corner of Kedzie Ave. & Foster Ave). Call (773) 478-0202 to RSVP. Lakeview Action Coalition will hold the Walk for LAC June 14th. Visit LAC's event site for more information. Bethel New Life will hold its Annual Beth-Anne Place Open House Luncheon on June 19th. RSVP to Jennifer at 773.287.2711 ext. 6020 or jthomas@bethelnewlife.org. Photo: Linda Greene and Teresa Prim teaches participants the essentials of Single Family Housing Development. The Chicago Tribune recently profiled a new effort to revitalize the Near West Side. CRN members, Interfaith Organizing Project and of Heartland Housing will co-develop the Viceroy Hotel into permanent, supportive housing. Rev. George Daniels of Interfaith Organizing Project and Andy Geer of Heartland Housing are CRN Board members.